The app info screen in Android has always been hugely useful, and it's even more so in Android 6.0. You can uninstall an app, see permissions, change notification settings, and more. Google made it a little harder to access an app's info page in Lollipop, but in Marshmallow it's easier again. It's just a tap away from the recent apps list. Previously, you could access app info by long-pressing on an app's icon in the corner of its card in the recent apps list. That only worked if you had developer options enabled, though. 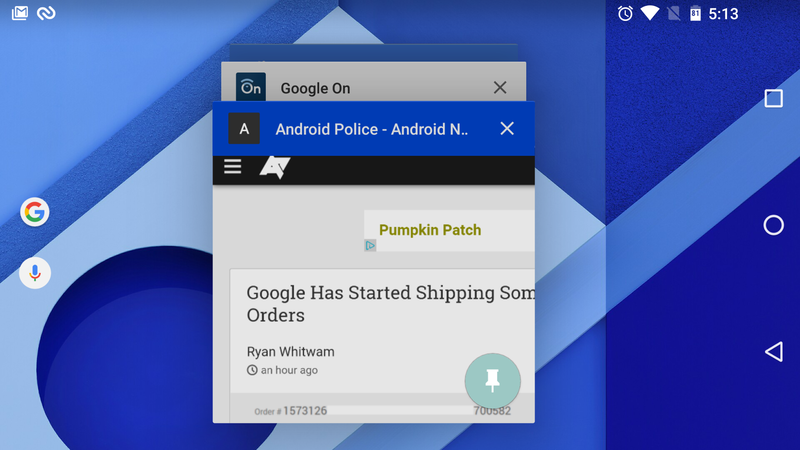 In Android 6.0, you can just tap on that icon to open app info, and it works without developer options. There is a caveat—this doesn't seem to work for all devices, and we're not sure why. We've successfully tested on a Nexus 6, Nexus 5, and Nexus 5X, but it doesn't seem to work on the Nexus 6P. Some people have also had problems getting this to work on phones that we've seen no issues with. No promises. Thanks to +Mathias Tillman, we can put this head-scratcher to rest. The single tap gets enabled when you turn on any service in Android's Accessibility settings, like Lastpass or Pushbullet. Without any of them on, a long-press is needed in Recents. If you want a more technical explanation, check out the code block at line 735 in Android 6.0's version of TaskView.java and note the absence of the single-tap Accessibility shortcut in Android 5.1.1's.